It's too soon to fully judge Duncan's tenure. There are lots of strong opinions in Washington and around the country about Duncan. Privately, insiders' views range from "he's the most committed and effective secretary of education in the department's history" to "he's a jock who's in way over his head on policy." Wow. I wish I agreed with that. But with the entire country embracing Race to the Top, Gun to the Head policies like Common Core, I'm not feeling the love. The high-stakes testing and developmentally inappropriate tasks for our children (and not his, or Duncan's, or Obama's) are intolerable. That's not to mention the junk-science teacher ratings that have been foisted upon us, rejected by none other than the American Statistical Association. Education is apparently on the president's "Eff-It" list. At this year's White House Correspondents Dinner, President Obama said that he didn't have a bucket list, but with time running out on his administration, he did have something that rhymed with it. The president's choice of John King* to oversee the department after Duncan is a signal he's not that concerned with education politics at this point. That's clever, but not precisely accurate. It appears to me that President Obama, who's certainly in a position to say "Eff-it" to pretty much anything, has decided to continue with the reformy policies that are King's signature. 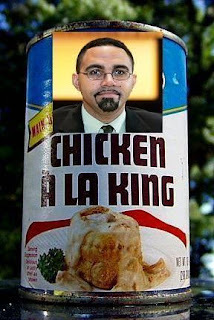 While it wasn't clear to UFT President Michael Mulgrew, who deemed King suitable as an independent arbiter for our evaluation system, it's quite clear to anyone paying attention that John King supports all things reformy, specifically including Common Core and junk science evaluations. The education debate is about to get nastier. John King is an accomplished African American educator who helped found a highly regarded charter school in Boston. His personal story is as compelling as any education official in the country. Most reform critics don't want to tangle with him publicly, if for no other reason than they have sense enough to recognize the gross optics of well-heeled white people explaining to an African American man why we shouldn't have demanding expectations for educators serving low-income minority youth. I'm not sure the education debate can get any nastier. For one thing, our unions are under attack, and SCOTUS may reduce us to virtual "Right to Work" status. For another, accomplished though King may be, I've seen precious little evidence of thoughfulness from him, Diane Ravitch goes so far as to call him "brilliant" based on his academic credentials. But King is remarkably thin-skinned and unable to deal with criticism. He thinks it's beyond the pale when people comment that his signature programs, Common Core and junk science, are not good enough for his own children, in private schools. Furthermore, John King shows little evidence of being able to play well with others. He actually canceled a series of public meetings when people dared disagree with him. In fact, he went so far as to call teachers and parents special interests. That's what we get for advocating for the kids we love, I guess. In Spanish, they say, "Tiene doctorado pero no es educado." This means, roughly, he has a doctorate but he isn't educated. In Spanish, being educated means not simply sitting through some classes, but rather behaving well. King's been to Harvard but treats the people he ostensibly serves with a sorely limited scope ranging from indifference to outright contempt. There is no way to read King's ascension other than as a slap in the face to teachers unions, especially the New York-centric American Federation of Teachers, which has been sharply critical of the future secretary. If it's a slap in the face, that's not precisely the "Eff-it" Rotherham mentioned earlier. If Obama is "not that concerned" with education politics, why would he bother to slap us in the face? Look for them to ratchet up the pressure on Hillary Clinton to distance herself from reform in a visible way, particularly in a primary fight where she needs labor's support and her political problems lie to the left. I've seen no evidence of pressure on Hillary Clinton to do anything but smile as both AFT and NEA endorsed her. In fact, though we had ample evidence of Barack Obama's reforminess in 2012, we endorsed him unconditionally. This was very odd, as LGBT and immigrant groups managed to extract concessions from him. If Hillary Clinton has distanced herself from reformy Obama policies in any way, I'd love to hear about it. How about it, AFT, UFT and NYSUT leadership? Is Rotherham right? Have you got any demands for Hillary? Thanks to Sean Crowley for the photo.